The all-new 2019 Hyundai Santa Fe made its debut at the 2018 Geneva Motor Show, with news that it will eventually come as a plug-in hybrid. Unfortunately, at intial launch, the Santa Fe will only be offered with a selection of ICE powertrains. However, Hyundai made it clear that the 2019 model is paving the way for hybrid and plug-in hybrid variants. The automaker didn't divulge further details about the PHEV, but several pieces of overall model information were revealed. The current Santa Fe is somewhat strangely offered as two different models: the five-seat Santa Fe Sport and seven-seat Santa Fe. Its corporate cousin, the Kia Sorento, is set up in the same two configurations, however, it's marketed as a single model with different seating options. For 2019, the Santa Fe will follow suit ... sort of. 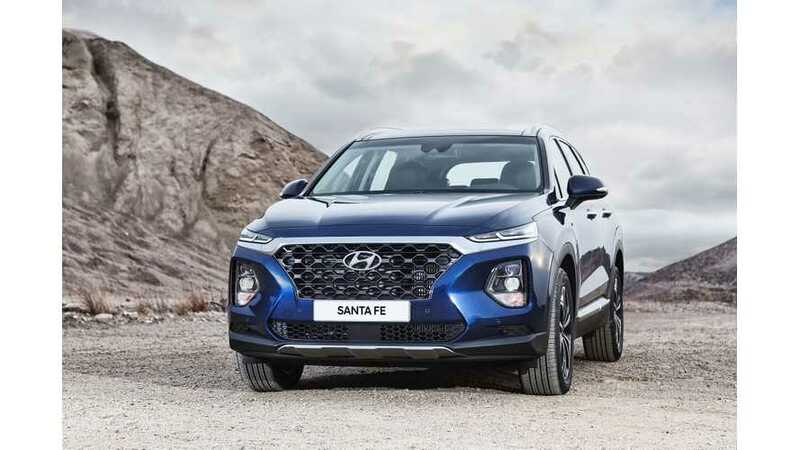 The short-wheelbase, five-seat model will simply be called the Santa Fe, while the long-wheelbase model will be coined Santa Fe XL. Perhaps Hyundai will continue to market the vehicles as two separate models and just intends to better clarify the difference? There is not yet been official clarification regarding whether or not both models will become available with a plug. We can only hope that this is the case, but it's more likely that the smaller vehicle will be the one with a PHEV option. Since Hyundai and Kia are accelerating electrification efforts and already have multiple smaller SUVs in either current (or upcoming) hybrid, plug-in hybrid, and battery-electric configurations, it would make perfect sense for the new offering to be available in the larger model. Click here to see a walkaround of the 2019 Hyundai Santa Fe from Geneva, as well as an in-depth first drive review and more photos.